A singular response to a simple question posed by a Chinese journalist to Gambia’s president, threatened to obscure an otherwise reasonable and sincere effort to respond truthfully and accurately. President Barrow assumed office without pretense and with genuine openness about his lack of preparedness for the job which he admitted publicly that led him to solicit help and advise from those around him. Frequent missteps from the Office of The President seem to suggest that the president is not being served well by his staff and a crowd of advisers. Barrow’s response to the One China Policy question posed by the journalist drew the ire of his opponents and the sympathy of his supporters. The question to Barrow was, to paraphrase, you have been holding on to the One China Policy since you assumed office last year – the journalist meant early this year – “and you have been very dear to that principle, what’s so strategically important about this?” The phrase One China Policy was obviously not drummed into his ears since he assumed office, especially in the preparatory phase of his China trip. His response that referred to Gambians belief in “unity and oneness” seemed to suggest that it was in reference to the resumption of diplomatic relations between Gambia and China – broken by “the decision of one man and not the Gambian people” and not about Taiwan being an integral and inseparable part of China. Barrow’s response was perplexing enough to instinctively led the journalist to exclaimed “great point there, Mr. President. Anything shy of a complimentary comment would have been considered impolite, especially from a journalist from the host country. Obscured amidst all of the hullabaloo was Barrow’s less than thought provoking response but sincere performance in response to the other questions. What his responses, in general, lack in insight, they make up in sincerity and candor – two infrequently utilized but valuable commodities in diplomacy. At least, the journalist appreciated Barrow’s comportment and responses by unabashedly expressing her delight at his use of the adjective “genuine” in describing the type of investors he’s interested in inviting to The Gambia. ” I like that adjective you’ve used – “genuine”, she said gleefully. Who is considered a genuine investor, she asked, probably insinuating that China is more worthy an investment partner than Taiwan. We may be reading to much into this particular exchange because it was revealing from our vantage point. China is very conscious of its position in the world, with the second largest economy and her increasingly visible role in Africa. It was, therefore, not surprising that the 2015 Forum on China – Africa Cooperation (FOCAC) held in Johannesburg came up during the interview. 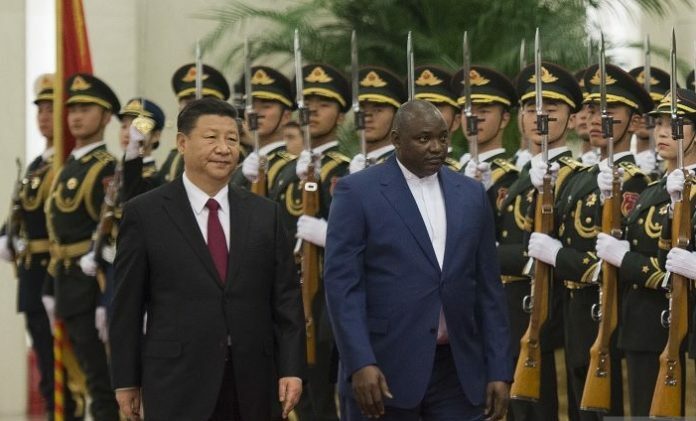 It was at the 2015 FOCAC when China pledged $ 60 billion in economic investment in the form of grants, zero interest loans, concessional loans, buyer’s credit as well as commercial financing. Conscious of the criticisms leveled against the West’s economic relations with Africa as being one of exploitation, particularly of the continent’s mineral resources, China downplays its interest in Africa’s natural resource endowment and instead lay emphasis on industrial capacity cooperation and what it refers to as “strategic complementarity.” This strategy is viewed with a high degree of skepticism among Western countries, citing Angola where oil-backed loans have been routine between the two countries. When President Barrow was asked about where is The Gambia in China’s blueprint for Africa, the journalist had in mind what type of economic cooperation Gambia prefers and expect. Several African countries have started to rethink Chinese economic policy and overall strategy and the debate is timely. China is still a developing economy with similar problems as ours – a youthful population and high unemployment rate. While keen on exporting its labor intensive industries to Africa, it will be doing so along the exportation of excess Chinese labor which has serious implications, both economic and social. Striking the right balance is what many African countries are grappling with because the sight of a Chinese laborer pushing a wheelbarrow at a construction site in any African city is difficult for an African politician to explain, much less justify, to an unemployed African youth. President Barrow promised to exercise due diligence in screening prospective investors before inviting them to The Gambia. We expect the same criteria to be applied henceforth to ensure proper an efficient utilization of public funds. The public procurement record of the new administration has been nothing to write home about. With Barrow’s promise to his Chinese hosts, we expect him to see it through. Who said the interview was a dud?